While all Lutron dimmers can save money on energy expenses and maintenance costs, not all dimmers share the same functionality. Before developing a light control strategy, you should understand a few basic facts about dimmers. Special requirements Rated for cold filament inrush (positive and negative periods may not be equal, resulting in a net DC voltage). Do not use on magnetic low-voltage (MLV) or Electronic low-voltage (ELV). Special requirements Symmetric cycles (VDC ≤ 2), smooth turn off (positive and negative periods are equal for safe MLV transformer operation). Include transformer losses when calculating the load. Special requirements Symmetric cycles (VDC ≤ 2), smooth turn off (positive and negative periods are equal for safe MLV transformer operation). Include transformer losses when calculating the load. Low end trim capability. Special dimmers are designed and UL listed to send power and control signals to each type of electronic fluorescent dimming ballast. Special dimmers are designed to send power and control signals to each type of electronic LED driver. Special requirements LED light source must be properly matched to LED driver, and LED driver must meet control specifications for control type (e.g. IEC for 0-10 V). During normal operation, dimmers get warm to the touch. Wallbox dimmer efficiency is typically around 99%. The other 1% is dissipated in the dimmer as heat. So, a 600 W load on a 600 W dimmer would produce around 6 watts of heat. This is approximately the heat generated from a small nightlight. Operating on its rated load, Lutron dimmers will stay below the UL limits of 140º F (60º C). To help the dimmer dissipate the internal heat normal to operation, a typical dimmer is wider than a switch. Dimmers can be ganged together such that the space is the same as switches. A portion of the fins (heat sink) must be removed. The fins are grooved to make the removal of fins easy with a pair of pliers. 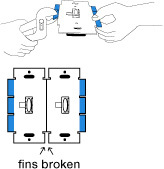 The removal of fins reduces the wattage capacity (load) the dimmer can control. The stated VA (volt-ampere) rating is the capacity of the dimmer that includes the magnetic transformer heat losses and the lamp load. A Lutron MLV dimmer UL listed for 1,000 VA can be loaded with a full 1,000 VA lamp load. A transformer dissipates up to 20% of the connected load as heat. Better transformers dissipate less than 10% as heat. Added together, the lamp load and the transformer loss determine the dimmer capacity required. Electronic low-voltage transformers also dissipate some heat. These inefficiencies are small enough to be accounted for in the dimmer rating. A Lutron ELV dimmer UL listed for 600 W can be loaded with a full 600 W lamp load. If ganged with other dimmers, standard derating rules apply.